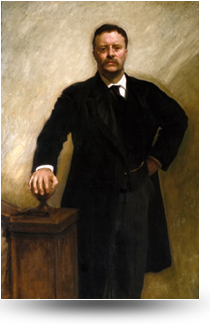 When Theodore Roosevelt became president of the U.S. in 1901 America’s society and economy were changing rapidly, and with his energy and visionary leadership he set the maturing nation on the path to prosperous growth and diplomatic influence that would last throughout the 20th Century. By the time he left office in March 1909, Roosevelt also had changed forever the influence and scope of the presidency. Though he remains the youngest person ever to hold America’s highest office, Roosevelt was one of the best prepared to be president, entering the White House with a broad understanding of governmental and legislative processes and with executive leadership experience. He led the U.S. onto the world stage by becoming actively involved in foreign affairs. On the home front, Roosevelt believed the federal government had a role, even an obligation, to ensure a level of equality in Americans’ daily lives and used government regulations and policies to bring about social and economic justice. In contrast to those who served before him, Roosevelt believed the president had the power to act except in areas specifically prohibited by law or granted in the Constitution to Congress or the Courts. He put this approach to good use in 1902 when he negotiated a settlement to the anthracite coal strike, the first time the federal government intervened in a labor dispute and recognized the rights of organized labor. Roosevelt also negotiated with Congress to see the Pure Food and Drug Act passed in 1906, putting in place many safeguards Americans take for granted today involving food safety, quality controls in manufacturing, and drug labeling. In addition, he fought against unfair trade practices, establishing precedents for the president’s intervention in business, trade and consumer affairs. In international affairs, Roosevelt also acted boldly and decisively. He negotiated an end to the Russo-Japanese War of 1904-1905 and became the first American honored with the Nobel Peace Prize. Realizing that the Navy needed to be able to move ships quickly between the Atlantic and Pacific oceans, he acted to recognize the fledgling country of Panama, negotiate control of the Canal Zone and push to see the Panama Canal built, one of the grandest engineering projects of the 20th Century. Considered the father of the modern American Navy, Roosevelt persuaded Congress to provide funding for modern steel-hulled battleships and sent the Great White Fleet—16 ships from the Atlantic fleet—in an around-the-world cruise, which raised America’s visibility and respect among world powers. Roosevelt left his greatest mark on conserving America’s natural resources. He realized the country’s abundant resources were being used faster than they could be replaced or replenished, and that great natural wonders like the Grand Canyon were in danger of commercial development. This led him as president to use executive power like none of his predecessors had, to protect nearly 230 million acres of land, including 150 national forests, the first 55 federal wildlife refuges, 5 national parks, and the first 18 national monument sites.